Over at The Wild Hunt, and on the Witchvox Facebook page which links to a short review on this pagan blog, there is discussion of a new self-published book by Ben Whitmore, Trials of the Moon: Reopening the Case for Historical Witchcraft,which seeks to critique and question many of the assumptions and statements of Ronald Hutton's historical examination of the roots of modern pagan witchcraft, The Triumph of the Moon. HUH? Leland's shoddy transcription makes him a flawlessly accurate ethnographer? I don't think so. to at least a few people in any era." That's nice, but your personal insights are not proof of anything. That is the difference between what historians do and, apparently, what those who are unqualified to critique them do. In refuting Hutton's description of Gerald Gardner's long list of fraudulent claims about his own pedigree, Whitmore writes: "So, given the interests of his friends and acquaintances, I would be surprised if a man of Gardner’s leanings hadn’t been a Co- Freemason and a member of the Holy Royal Arch.174 He certainly would have been foolish to falsify this degree to Aleister Crowley, who could easily test him." Again, HUH? HUH?, I say. Regarding Dorothy Clutterbuck, and Hutton's claims that her diaries don't reveal any explicit evidence of pagan or occult belief, Whitmore opines: "Is this really the Church stalwart Hutton has portrayed? 'Simple, kindly, conventional and pious'? True, witchcraft is never explicitly mentioned in the diaries, but then, Dorothy intended them to be viewed by her visitors. I think their 'relevance to paganism' is worth a more careful look. We may possibly gain a further insight into them by comparing them with the writings of Katherine Oldmeadow, who lived near Dorothy and was her best friend. Dorothy always intended the diaries to be given to her, and she received them upon Dorothy’s death." Soooooo...Whitmore is saying we should read into Dorothy's diaries, inferring things that aren't there, by assuming that what is written in her best friend's diary is somehow closer to what Dorothy actually meant to say? Generally, Whitmore's writing is readable and engaging, and often insightful. But at other times, it's maddeningly vague: "Ultimately, it remains entirely reasonable to ask whether paganism has survived to the present day, and whether witchcraft is one expression of that paganism — reasonable, that is, given certain (entirely reasonable) usages of the terms ‘paganism’ and ‘witchcraft’. Hutton’s usage diﬀers, and there our ways part." Hutton's usage differs...from what, exactly? Your own? Please say so, then. "One point Hutton and I certainly agree on is that Wicca and its various oﬀ-shoots have value regardless of their origins. As a priest of the Goddess and God no historian can take away what I’ve learnt and experienced, or the joy and wisdom I’ve found within the Craft. I’m well aware that the founders of our religion were flawed people (as am I), and yet they have bequeathed to us a thing of great value. And here is one of the mysteries that priesthood reveals to us: through our training we become more sensitive to the faults and oddities of the human personality — our own and others’ — and yet we also begin to see how this imperfect human vehicle can paradoxically express divinity, and be a channel for great inspiration, energy and beauty. Sincere or cynical, having once oﬀered our service to the Gods there is every chance that we will deliver, and wittingly or unwittingly be drawn to their work. The founders of our cult were imperfect, and Hutton is imperfect too; and if ever Hutton was inspired to honour the Goddess in some way, I think She has taken him up on the oﬀer: he says his book is a triumph for the Moon, and perhaps it shall prove so, for it stands as a challenge to all the Craft, an incitement to us to seek the real truth." Let me get this straight: you're saying the gods, in their infinite wisdom, set Hutton's book before you as an opportunity, nay, an incitement, to expose its flaws so you could reveal the "real truth" to the rest of us? "Leland's transcription from the original manuscript" does not still exist, so far as is known. What still exists is the handwritten copy of Leland's book, "Aradia," that he sent to the printer. It contains the same Italian passages as the printed text, and they do seem to be taken from a manuscript in Italian. But they are very far from being the whole of that manuscript. I wrote about all this in my essay which Whitmore cites. But Whitmore seems not to have understood much of anything that I said, and documented, in that essay. I would also say that he leaves out the Pagan/Heathen Traditions that did survive such as Asatru and Romuva. 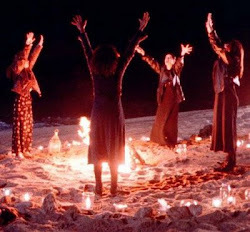 Comparing them to Modern Wicca shows a lack of similarity and points out the differences between a modern tradition, and one that grew up with mankind. It should also be clear to anyone who has any knowledge of occult subjects that Modern Paganism...ie Wicca...has its roots in Hebrew Kabbalism via the Golden Dawn and the OTO and not any western European Pagan Tradition. The critique you present only makes sense because Whitmore's statements have been fully removed from their original context. For example, his line about "taking a leaf from Freud" actually refers to Hutton's unwillingness to consider the possibility that the Saxon earth goddess might have originated independently of the Greek earth goddess. This matter is certainly conjectural, and neither Hutton nor Whitmore nor anyone else has any conclusive evidence pertaining to it. However, you present this quote of Whitmore's from Freud by saying that it was intended as a "refutation of Hutton's discussion of the lack of evidence for widespread matristic cults or goddess worship"
This is a completely misleading description of his arguments. In fact, the subject of "matristic cults" is not even discussed in the book at all. Also the issue of "clearing Leland of doubt" was in reference to perceived inconsistencies in his writings. This statement was not intended as proof of the original letter's authenticity. Statements like "that's nice, but your personal insights are not proof of anything" are in complete disregard for the fact that it was never intended as proof to begin with! I'm glad Whitmore puts his biases on the table, instead of hiding behind a veil of pretended impartiality. What matters is that our arguments are grounded in reality and that they consider the various sides of an issue. Objectivity is not achieved simply by pretending not to care about an issue. Whitmore's main contention throughout the whole book is that an adequate history of the Craft's origins has never really been written. His issue with Hutton is simply that many people mistakenly consider his writings to be a conclusive account of our history, when there are in fact so many unresolved issues. Yet when he incites us to seek the real truth, you say that he is inciting us to allow him to reveal the truth to us? parsifal81: what issues do you think Whitmore considers "unresolved?" I didn't see anything like this mentioned in his book. As for your suggestions that I am not "objective" or that I am somehow "pretending not to care" or I am "hiding behind a veil of pretended impartiality," I am not claiming in any way to be impartial or objective here. I think a self-published critique of a best-selling historical study is fair game for any casual reviewer, particularly when such critiques are not appropriately rigorous or objective in their own right. Thanks for your comment. Looking back at your article I agree, describing it as a 'transcription from the original manuscript' is inaccurate: you describe it as his working draft, which contained some untranslated passages. Mea culpa. You also say that I seem not to have understand much of anything that you said and documented in that essay. I would be very pleased and grateful if you could briefly (or lengthily) flesh these concerns out and send them to me to post on the page on which my book is advertised. I have left space at the bottom of that page for exactly this kind of criticism to be aired. I am quite prepared to be wrong, and I feel I owe it to Hutton (not to mention my readers) to strive for accuracy and truth rather than jealously defending mistakes. Contact info is on the website http://www.goodgame.org.nz. Thank-you kindly. I'm honestly surprised debate regarding this crap is still going on. Many Wiccan's and Neo-Pagan's have since made peace with these issues within themselves. Wicca and NEO-Paganism are constantly evolving. The past is becoming less and less of a concern to modern youth. Thanks for saving me the time it would take to read it -- not that I would have in all likelihood and I certainly wouldn't have lasted all the way through it. "I am not claiming in any way to be impartial or objective here. I think a self-published critique of a best-selling historical study is fair game for any casual reviewer, particularly when such critiques are not appropriately rigorous or objective in their own right." What you are actually doing on this blog is sniping; writing a hack job rather than a scholarly critique of Whitmore's work. You set up straw men that Whitmore never argued to knock down, then you launch an "ad hominum" attack for Whitmore's complete transparency regarding his own biases. You make much ado regarding Whitmore's lack of academic credentials (which he transparently admits), without due transparency regarding your own. Clearly, you have not carefully read Whitmore's work, or you would not have made such silly remarks about "lack of rigorousness," regarding this painstakingly researched and thoroughly documented study. You are speaking as though qualified to evaluate an historian when, in fact, you probably have no more than a Masters degree in advertising or communications. The fact that you do not mention your own academic credentials on your blog casts yet more aspersion on your critique of Whitmore. In fact, you are looking here like Dr. Laura, whose PhD is in English literature and not psychology as most of her listeners believe. You appear to be having an emotional reaction that someone has dared to publish a scholarly critique of one of hyour sacred cows - or at least favorite books. The primary problems with Hutton's Triumph of the Moon lie not in that it some sort of "evil" attack on cherished Pagan myths, but rather that it is full of academic holes. Far too frequently, Hutton plays anthropologist, although he is not trained as an anthropologist nor does he even attempt to use the ethnographic method. Moreover, as Whitmore has shown, Hutton misquotes and misrepresents his sources. Finally, Hutton makes sweeping speculative statements completely outside of his stated geographic region of study as, for example, in his completely unqualified remarks about Leland and Stregheria in Italy. Mr. Griffin: first off, the term is "ad hominem." It means "attack the man and not the argument." Which is, ironically, what you're doing here. My comments about Whitmore's book are confined to statements in his book. You, on the other hand, are making insulting remarks about me, personally, suggesting I have some sort of complex and am somehow projecting my own insecurity into my comments. I don't reveal my own academic credentials here because they're not really relevant, any more than Whitmore's are. Someone can be perfectly capable of writing a rigorous scholarly essay or book without being possessed of a PhD. Whitmore having or not having a PhD is not the issue; his lack of familiarity with the form and etiquette of academic research and writing are. His not being an academic is worth mentioning because his inability to craft an effective critique of Hutton's work is directly related to this. The fact that you think my own academic credentials are somehow at issue here is perplexing, but, since you asked, I don't have a PhD, and have published a number of scholarly essays in books and proceedings, and have co-edited two scholarly books. None of these have been self-published. So this apparently means I have at least rudimentary ability when it comes to scholarly writing. I don't take issue with Whitmore's credentials as much as I take issue with his non-scholarly critique of a scholarly work. I do not find it to be painstakingly researched or thoroughly documented. I found many of the main points to be conjectured and without merit, based on my own familiarity with Hutton's work and with the sources being discussed. I note that you deleted my rebuttal to your above statements and still have not responded to my above criticism of Hutton. This is the second flame war tactic that I have witnessed you employ on this blog. Have you not yet realized Peg, that you can not censor the Blogosphere? I and other bloggers will merely set the record straight on our own blogs, if need be. Mr. Griffin: As of your posting of the above accusation of "censorship", I have not "censored" anything. I have not deleted a single response to this blog post. You are either mistaken, lying or delusioal. Oh and by the way, one does not publish a "blog" the correct term is "blog post." My blog is not the place to publicize your writing. So, yes, I have removed your post (the one you posted after the censorshio accusation which is above). That is not censorship; it is demonstrating that I don't want you to take advantage of my blog to promote your insulting comments about me. As you can see, when a post is removed, there is a notice saying as much, So your previous accusation of censorship was completely unfounded. Come on Peg. Readers on the Blogosphere are not as gullible as you clearly believe we are. As anyone familiar with moderating comments on Blogger knows, the notice you refer to only appears when you do not check "Remove forever". You just proved not only that you are cherry picking comments as part of your little Witch War against Ben Whitmore and Trials of the Moon, but also that you are not above lying about it when exposed either. It is time that you learn that transparency, not censorship, rules the blogosphere. Anyone interested in seeing the truth need merely search "Hutton Pagan" search string on Google Blog Search, and will become crystal clear that I am not the only blogger objecting to your little Witch War tactics. Nonetheless, in the interest of fairness, I will repost below the original comment you censored. Let's see if now you have not perhaps learned to be more transparent in the Blogosphere, where neither censorship nor Witch War belong. Can we now get back to a serious discussion of ideas please. "My comments about Whitmore's book are confined to statements in his book." No, you are attacking Mr. Whitmore's ethos as an author rather than engaging in any sort of scholorly, critical examination of his arguments or of the substantial evidence Mr. Whitmore DOES present. "I don't reveal my own academic credentials here because they're not really relevant, any more than Whitmore's are." Then why do you open your so-called "book review" by attacking Whitmore's ethos - among other things by pointing out his lack of academic credentials? "Whitmore having or not having a PhD is not the issue; his lack of familiarity with the form and etiquette of academic research and writing are." And you call this a "book review"? You call this a critical and scholarly examination of Mr. Whitmore's arguments and presented evidence? You could better call it "Ad Hominem" (no matter correctly spelled or not) - You could also call it trying to "poison the well". - I personally would call if "flame war" rhetorical tactics. You can call it whatever you like, Ms. Peg, but what you are doing is certainly NOT "engaging in meaningful, scholarly discourse" or "examining arguments and presented evidence on their merits." Instead, you are engaging in cheap rhetorical tricks - precisely in order to AVOID engaging in any sort serious, meaningful scholarly discourse. Did I just do the same thing to you? Yes. You bet I did! It is called "mirroring" - exposing your rhetorical tactics for what they are by turning them around on you - and observing how you protest at the employment of your methods on you! Touche! - Methinks the Lady doth protest too much. I note that you likewise avoid engaging in any meaningful discussion of the simple arguments I just made about the holes in Professor Hutton's scholarship. Instead, in a completely predictable manner, you continue to engage in the same sort of cheap rhetorical tactics you employed in your so-called "book review." You write" "I do not find it [Whitmore's work] to be painstakingly researched or thoroughly documented." Then you clearly have only downloaded the free version of Whitmore's study, and are too cheap to pay the $11 for the fully documented version before making the same sort of sweeping generalizations that fatally flaw the scholarship of your idol, Hutton. There you go. I published your nasty, irrelevant comments. I did not censor them earlier, as I have not had to turn on the moderation settings UNTIL NOW, because of people like you. Since not publishing them would have obviously made you post even more lies about me elsewhere, again accusing me of censorship, I decided to post your remarks (which you say were censored earlier this week but which I have never seen until you just submitted them in the last 24 hours--gee, some people have a lot of time to flame others on the internet!) in all its mean-spirited glory. But be warned: I will not post any more links to your blog posts elsewhere so you can leave those out of your posts. I think your obnoxious, childish, anti-social behavior speaks for itself and no one needs to see anymore of it anywhere else. And I now have comment moderation enabled so you'll have to be patient about waiting to see your illustrious words up in bright lights. I don't plan to censor you in the future unless you continue to engage in this pointless ad hominem (see, I spelled it correctly). Best of luck promoting your blog. It is my sincere hope that the name calling will end here and that cooler heads will yet prevail. It is clear that you feel very passionate about Professor Hutton's conclusions. Sadly, this appears to be interfering with your evaluating the evidence presented by Mr. Whitmore on its merits instead of merely attempting to cast personal aspersion on Mr. Whitmore's work, merely because it is self-published and Whitmore does not have academic pedigree. It is as though you wish to say: "How dare a mere mortal challenge the God Hutton? ", when Professor Hutton readily admitted in that his conclusions are not the final word on anything. I am extremely pleased that you are now behaving in a transparent fashion. In my opinion, this will go far to diffuse what more and more bloggers are describing as a Witch War trying to suppress Mr. Whitmore's findings. Dude, you started the name calling. I don't make any such distinctions between mortals and gods; that is your own outrageous and rather ridiculous projection. I do not "wish to say" that, but it's certainly very telling that you did. God, what a goon, Peg!! You poor thing having to deal with loonies like this. Illuminating review too. "Whitmore writes: "So, given the interests of his friends and acquaintances, I would be surprised if a man of Gardner’s leanings hadn’t been a Co- Freemason and a member of the Holy Royal Arch.174 He certainly would have been foolish to falsify this degree to Aleister Crowley, who could easily test him." Again, HUH? HUH?, I say." Yes, Crowley, as a Master Mason and member of the Royal Arch, could easily test Gardner's claims of being the same. Just as I could, and just as any one with these credentials could test my claims. In initiation we're given certain signs, grips, passwords etc., and these are uniform throughout the world. If someone couldn't reproduce these on demand, they'd be faking. Hopefully that clarifies that one. @Jordan: My point is that Whitmore is using this example as a point of pure conjecture and speculation; there is no proof Gardner possessed these degrees, so the imagined scenario vis a vis Crowley is irrelevant. I found the book was full of examples like this: borne of pure conjecture but trying to prove a point as if the speculation was somehow evidence of something. The point regarding Dorothy Clutterbuck's journals falls into this category as well. Yes, Whitmore's suggestion that Gardner was a member of the Royal Arch is pure speculation. But it follows a convincing refutation of Hutton's claim that Gardner COULD NOT have been a member; Whitmore explains why Gardner COULD easily have been a member. Actually his speculation might have made an interesting small research project if it were not twenty years or so too late; the "friends and acquaintances" who might have been able to say whether he had been a Co-Freemason and member of the Royal Arch are presumably now dead. I have no problem with speculation but it cannot be offered as evidence of anything. I found this somewhat casual approach to conjecture to be a real problem with this book. I plan to re-read it soon and write a longer review. "I have no problem with speculation but it cannot be offered as evidence of anything." Are you asserting that there was nothing speculative about Hutton's arguments? Claiming that the Wiccan idea of a mother earth goddess originated only within popular 19th century literature is not only conjectural, it's unlikely. I'd get on that "re-reading" as soon as possible. "I'd get on that "re-reading" as soon as possible." Because then maybe you'd have something relevant to say. You mean, like you, someone who spends their time trolling other people's blogs making mean-spirited comments? Season of the Witch: Finally! THE WICKER TREE gets a sneak preview...in Wales.